Q: What is the pixel LED strips? A: Pixel LED strips are made of 3 parts: PCB, LED and driver IC. It allows you to control LEDs individually by sofware. Usually 1pcs of IC drives 1 or 1 group of LEDs as 1 pixel. Q: What is the driver IC? A: IC is a integrated Chipset, usually it has 3 channels of PWM output-pin. Popular IC type: LPD6803, ws2801, LPD8806, ws2811/ws2812b, TM1803/TM1804/TM1809/TM1812, UCS1903/UCS2903/UCS512, etc. Q: What is the popular software? A: ledEdit2014, Arduino, raspberry, etc. Q: Pixel LED strip voltage drop problem? 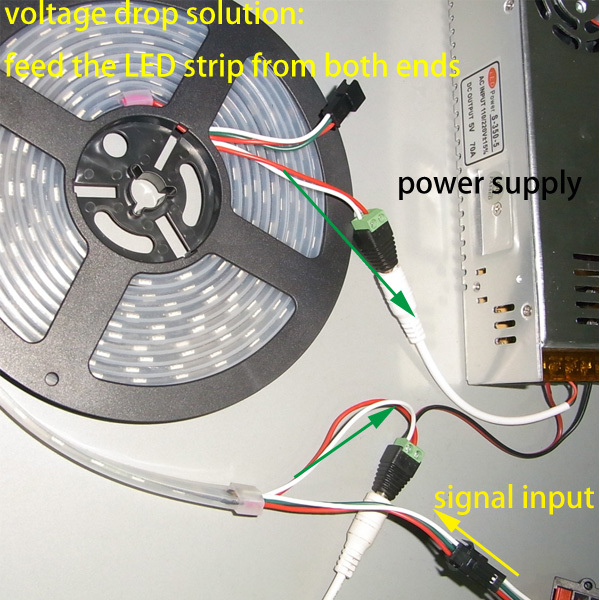 Q: Pixel LED string voltage drop problem?